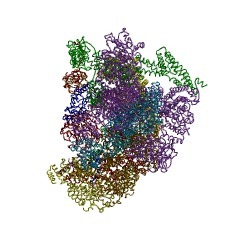 The anaphase promoting complex or cyclosome (APC2) is an E3 ubiquitin ligase which is part of the SCF family of ubiquitin ligases. 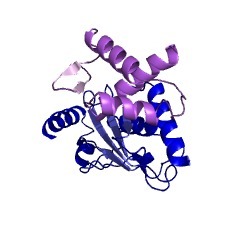 Ubiquitin ligases catalyse the transfer of ubiquitin from the ubiquitin conjugating enzyme (E2), to the substrate protein. 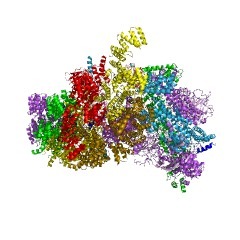 The anaphase-promoting complex (APC) or cyclosome is a multi-subunit E3 protein ubiquitin ligase that regulates important events in mitosis, such as the initiation of anaphase and exit from telophase. 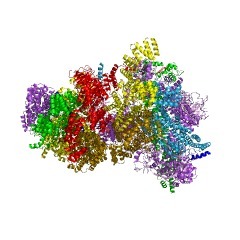 The APC, in conjunction with other enzymes, assembles multi-ubiquitin chains on a variety of regulatory proteins, thereby targeting them for proteolysis by the 26S proteasome. 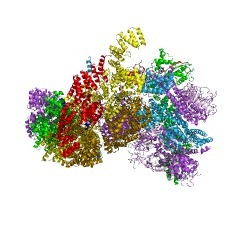 This entry represents a domain found in the C terminus of APC subunit 2. There are 1082 APC2 domains in 1081 proteins in SMART's nrdb database. Taxonomic distribution of proteins containing APC2 domain. This tree includes only several representative species. 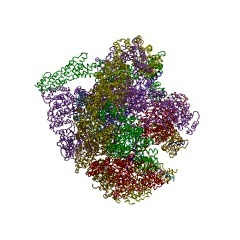 The complete taxonomic breakdown of all proteins with APC2 domain is also avaliable. Click on the protein counts, or double click on taxonomic names to display all proteins containing APC2 domain in the selected taxonomic class. 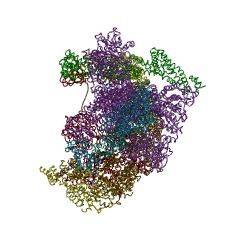 An architectural map of the anaphase-promoting complex. The anaphase-promoting complex or cyclosome (APC) is an unusuallycomplicated ubiquitin ligase, composed of 13 core subunits and either oftwo loosely associated regulatory subunits, Cdc20 and Cdh1. 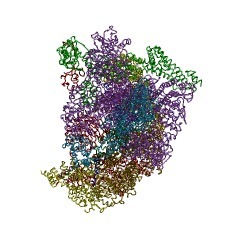 We analyzedthe architecture of the APC using a recently constructed budding yeaststrain that is viable in the absence of normally essential APC subunits.We found that the largest subunit, Apc1, serves as a scaffold thatassociates independently with two separable subcomplexes, one thatcontains Apc2 (Cullin), Apc11 (RING), and Doc1/Apc10, and another thatcontains the three TPR subunits (Cdc27, Cdc16, and Cdc23). We found thatthe three TPR subunits display a sequential binding dependency, with Cdc27the most peripheral, Cdc23 the most internal, and Cdc16 between. 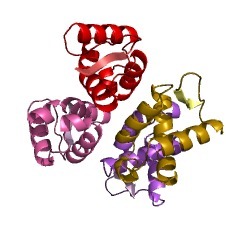 Apc4,Apc5, Cdc23, and Apc1 associate interdependently, such that loss of anyone subunit greatly reduces binding between the remaining three.Intriguingly, the cullin and TPR subunits both contribute to the bindingof Cdh1 to the APC. Enzymatic assays performed with APC purified fromstrains lacking each of the essential subunits revealed that onlycdc27Delta complexes retain detectable activity in the presence of Cdh1.This residual activity depends on the C-box domain of Cdh1, but not on theC-terminal IR domain, suggesting that the C-box mediates a productiveinteraction with an APC subunit other than Cdc27. We have also found thatthe IR domain of Cdc20 is dispensable for viability, suggesting that Cdc20can activate the APC through another domain. We have provided an updatedmodel for the subunit architecture of the APC.